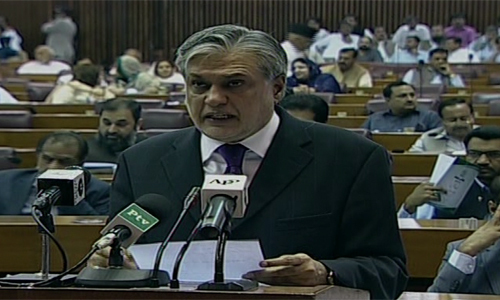 ISLAMABAD (92 News) – Federal Finance Minister Ishaq Dar unveiled a budget of over Rs 4,451 billion in the National Assembly on Friday with focus on attracting investment and providing relief to the common man, which is 3.5 percent more than last year’s budget. Total resources have been estimated at Rs 4,168 billion and the government has to bear the deficit of Rs 1,328 billion despite imposing new taxes of Rs 253 billion during the next fiscal year. Laying budgetary proposals before the National Assembly, Ishaq Dar said despite critical challenges during the last two years, the government has been successful to turn around the economy which is now on a positive trajectory. He said the government has been successful to steer the country out of economic crisis being faced for the last many years and now it is stable and can meet any future challenge. The minister said the government devised a three-point strategy in 2013 to revamp the economy which include save the country from being a defaulter, gaining macroeconomic stability, creating more opportunities for employment and reduce poverty. Ishaq Dar claimed that today the economy is stable and heading towards sustainability. He said foreign exchange reserves have surged to US$17 billion which will further grow to US$19 billion during the next financial year. He said Karachi Stock Market which was 19,916 points has crossed the level of 34,000 points which shows a 70 percent increase in the stock market business with similar increase in market capitalization. The minister said the fiscal deficit which was five percent during the outgoing financial year will be brought down to 4.3 percent in the next financial year. Ishaq Dar said the government has prioritized the energy sector and has launched several projects in this regard. He said work is in progress to add 7,000 megawatts to the national grid besides another 3,600 megawatts through LNG-based power plants by December 2017. He said in addition projects like Dasu, Diamer-Bhasha Dam and Karachi nuclear power plants are also being executed to address the energy crisis. Ishaq Dar said that Rs 248 billion is being allocated for energy sector with an objective to generate additional cheap electricity and overcome loadshedding by 2017. An amount of Rs 102 billion has been allocated for the Benazir Income Support Program (BISP). He said the Baitul Mal budget is being doubled from Rs two to four billion. An amount of Rs 12 billion has been allocated to set up 217 tele centres all over the country in the first phase. Work is underway to connect 128 tehsils of the country, especially under developed areas with fiber optic. The minister also announced a three-year medium term macro-economic framework spanning over financial year 2015-16 to 2017-18. Under the framework, the target for GDP growth rate for the next fiscal year has been kept at 5.5 percent which would be taken to seven percent by 2017-18. Inflation would be kept to single digit, investment to GDP ratio at 21 percent, fiscal deficit 3.5 percent and tax to GDP ratio 13 percent. He said foreign exchange reserves would be maintained at the minimum of US$20 billion. Ishaq Dar said Lahore-Karachi Motorway is the priority of the government which will change the destiny of the nation. He said this project will generate job opportunities. He said amount is also being allocated for the construction of Abdul Hakeem Multan section, Sukkur-Multan and Karachi-Hyderabad sections of the Motorway. Ishaq Dar said Rs 185 billion have been allocated for the construction of bridges. He said China-Pakistan Economic Corridor (CPEC) project which will prove to be a game changer is a priority of the government and for this purpose work on Raikot-Islamabad Road will be started during the next fiscal year. For this purpose 29 billion rupees are being allocated. Similarly, ten billion rupees are being allocated for construction of Islamabad-DI Khan Road. About the revival of Pakistan Railways, the minister said a comprehensive plan has been devised in this regard which include dualization of railway track from Raiwind to Khanewal and Shahdra to Lalamusa. He said rehabilitation of Karachi-Khanpur track will be completed during the next fiscal year. He said 159 weak railway bridges will be rehabilitated by 2017. He said 170 new locomotives will be inducted into the system besides repairing 100 locomotives and purchasing of 1,500 new passenger coaches. He said a program is also being launched to renovate railway stations throughout the country besides improving signaling system between Lodhran and Kotri. The minister also announced Public Sector Development Programme (PSDP) amounting to over Rs 1,513 billion. Out of this, Rs 700 billion has been earmarked for the development projects to be carried by the federal government, while Rs 814 billion will be disbursed among the federating units for their development programs. Ishaq Dar said Rs 184 billion is being allocated for the construction of highways, while Rs 72 billion is being earmarked for the power related projects. The minister said Rs 62 billion is being allocated for China-Pakistan Economic Corridor (CPEC) project. Coming to the education sector, the minister said the government believes in the promotion of education and ensure raising its standard. For this purpose, Rs 20 billion is being allocated for 143 projects of higher education commission besides allocating Rs 51 billion for the Higher Education Commission for current expenditures. The minister said an estimate for the current expenditures during the next fiscal year is Rs 3,128 billion while the revised estimates for the outgoing fiscal year are Rs 3,151 billion. A sum of Rs 780 billion has been allocated for defence, increasing it by 11 percent. The minister said the nation has rendered matchless sacrifices in the war on terrorism. He said Rs 100 billion is being allocated in the next budget for future security arrangements and return of IDPs of North Waziristan. The minister said that to discourage undocumented economy, it has been decided that 0.6 percent withholding tax would be imposed on the fund transfers and banking instruments. However, the tax payers who file their returns will be exempted from this tax. He said the tax rate on dividend is being increased from 10 to 12.5 percent. However, the tax rate on mutual funds will remain ten per cent. He said that 10 percent advance income tax which was being received on the bills more than 100,000 will now be imposed on the bills up to 75,000 due to a decrease in power tariff. The minister said special incentives will be given in various sectors of exports, including product diversification, value-addition, trade facilitation, enhanced market access and institutional strengthening. For this purpose, Rs six billion is being allocated in the budget besides taking steps for reconstitution of export development fund. He said significant steps will be taken to enhance textile exports of the country. The minister said the rate of federal excise duty on cigarettes is proposed to be increased from the existing 58 percent to 63 percent to discourage smoking. Sales tax on import of different varieties of mobile phones is proposed to be increased by hundred percent. The minister announced a package of incentives for construction sector. He said under the PM Youth Business Loan Scheme, 15,000 loan applications have been approved while 20,000 applications are under consideration. Ishaq Dar announced to provide internship to fifty thousand unemployed graduates having education of 16 years during the next fiscal year. He said under the scheme, Rs 12,000 will be given as stipend to the internees. He said under the PM laptop scheme, 70,000 laptops have been disbursed among the outstanding students, which will continue in the next fiscal year. He said for all these schemes, Rs 20 billion are being allocated.